Overture streamlines many of your day-to-day tasks helping your agency run more efficiently and effectively. From classical musicians, bands, DJs, actors and many more. Overture has features tailored to you and the artists you work with. Overture is used by 1000s of agents and artists worldwide. Take a look below to see what people are saying. "With busy travel schedules, Overture has given us flexibility to conduct business out of office. Keeping contacts, calendars & contracts in one place." "Overture has made a real difference in the speed in which we can work, raising the overall level of productivity within the company." "The system is aesthetically pleasing and visually easy to understand. After the first 3 months of using Overture, we are very pleased with our decision." "Overture replaced 5 separate software packages in our day-to-day business. It does all they used to do plus more, it's revolutionised the way we work." 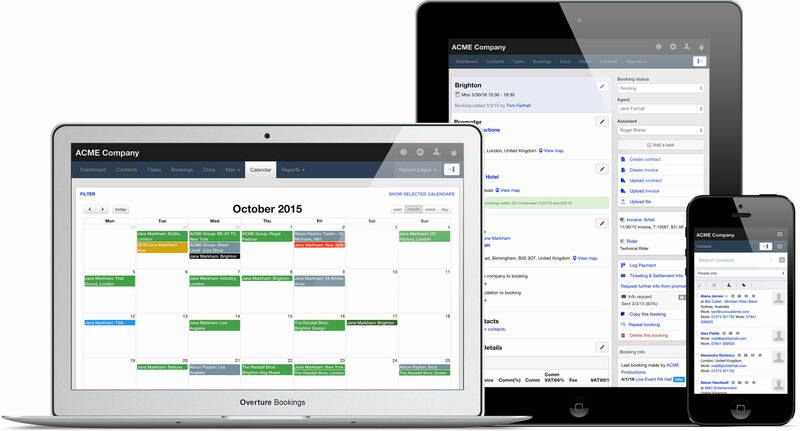 "Overture enables us to streamline business admin and work remotely. With the live diary we can keep on-top of our client's availability in real time which is excellent for castings." Overture is used worldwide by 1000s of agents and artists, including agencies working with models, make-up artists, teachers and others. So whatever your agency type contact us to book a demo and see how Overture can be tailored to your specific needs.